The demand for certified organic and fair trade products is growing steadily. Consumers want assurance that the products they are buying meet the organic and fair trade standards they value. In recent years, third-party certification has dominated the marketplace for providing consumers with this assurance. However, this third-party model can be expensive, a marketplace barrier for many small-scale producers the world over. Most third-party certifiers are private entities, accountable solely to their clients, and as a result the system has transparency and accountability limitations. Other models do exist, though. Two such models, detailed in the following articles, highlight the successful experiences of participatory and peer guarantee systems. IFOAM-Organics International and the World Fair Trade Organization (WFTO) provide two looks at alternative paths for producers and consumers. Participatory Guarantee Systems (PGS) offer a methodology to ensure social and ecological integrity by engaging stakeholders, including consumers, in a transparent system that prioritizes active participation and transparency for all stakeholders. The WFTO’s Guarantee System (GS) offers a “best of both worlds” approach, fusing peer review, member accountability and third-party certification. Market guarantees and product label claims are essentially about enabling consumers to make informed choices. Truly sustainable production and consumption are about recognizing that we are all interdependent upon each other and upon the Earth’s natural resources. Fairness is at the core of such relationships. Implicit in fairness is adequate trust and transparency in the systems that bring products from source to consumer. We want to see sustainable production and consumption, and the Principle of Fairness that goes with them, manifest at a large scale – out of “niche” markets and into the mainstream. Participatory Guarantee Systems (PGS) hold huge potential to realize these goals. PGS are locally-focused quality assurance systems. They certify producers based on the active participation of stakeholders and are built upon a foundation of trust, social networks and knowledge exchange. To date, most organic product claims come via third-party certification. The organic movement adopted this approach thirty years ago, seeking legitimacy from the dominant market paradigm, as well as improvement of its own consistency of practices and credibility in the market. That strategy has worked – the market has grown and is taken seriously worldwide by the private sector and governments alike. Most other social and environmental programs, including fair trade, have adopted the third-party certification model, and they too are seeing growth and success. This success, however, comes at a price. One unintended consequence has been to effectively disconnect the producer from the consumer. In a certain sense, third-party certification is a proxy for the trust that comes when the producer and consumer know each other well. Another consequence has been the removal of much of the learning experience and capacity building that occurred previously, because the International Organization for Standards (ISO) norms that guide certification do not really allow such exchanges. Moreover, third-party certification often shows itself to be costly and onerously bureaucratic, posing a barrier to market entry, especially for the most disadvantaged producers. In light of these limitations and challenges, PGS have become increasingly appealing to certain producers, especially those that operate on a smaller scale and sell in shorter supply chains and/or more local or direct markets. PGS directly engage the participation of farmers and consumers (as well as other interested parties) in assuring that production and handling of goods follow an agreed upon set of rules and guidelines. Basically, instead of having a third-party inspector come and do the checking, the farmer members of the PGS inspect each other to make sure the rules are being followed; and sometimes consumers linked with the PGS also make these inspections. During these visits, there are exchanges about how to make the farm (and the farming enterprise) perform better and more sustainably. Because the integrity and credibility of the whole PGS is at stake, and there is transparency throughout the verification process, there is very little incentive for and incidence of cheating. 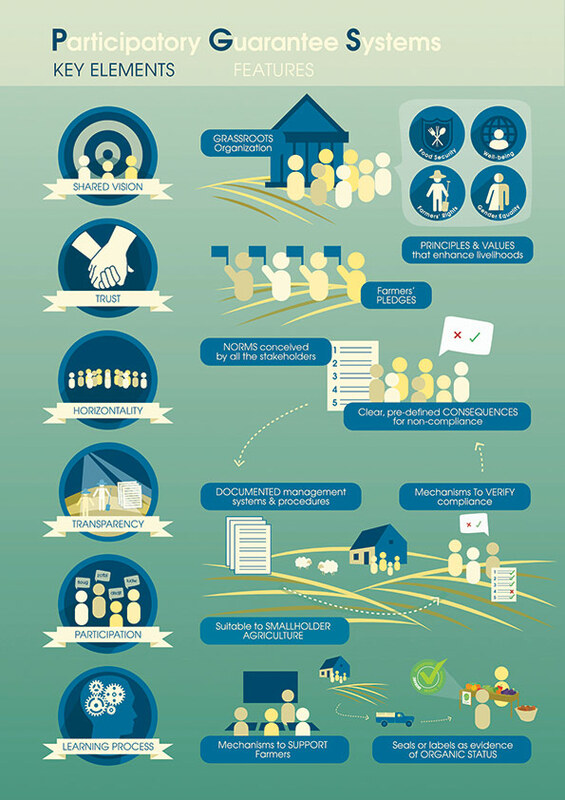 The key difference between PGS and third-party certification is exactly this kind of participatory, common-benefit approach, which brings numerous benefits, including: costs of participation are low, with voluntary time taking the place of monetary expenditure, paperwork and bureaucracy are often reduced, learning and improvement are emphasized as an integral benefit of the process, and closer (even direct) contact between consumers and producers engenders trust and a spirit of interdependence. Experience shows that the credibility of PGS is comparable to third-party certification systems. Recognition of this is growing. In Brazil, for example, the national organic regulatory system legally recognizes products verified through officially-registered PGS as equivalent to third-party certified goods. In India, if goods are sold as organic in the domestic market, the guarantee is almost always through PGS, as opposed to exports, which go through third-party certification regimes. In certain markets, however, the term organic or its equivalent (for example, biologique, ecológico, etc.) is legally regulated, and third-party certification is the only allowable mode of guarantee. In the U.S. and Canada, for example, Certified Naturally Grown is a PGS officially recognized by IFOAM-Organics International, with a steadily growing number of participating farmers. These farmers cannot actually label their products as organic because of the national regulations, but clear communication with their customers and other stakeholders about their practices overcomes this limitation. In France, Nature et Progrès is the world’s oldest PGS, in existence since 1972, and in many respects is one of the organic movement’s founding organizations. They, too, face and overcome similar restrictions under EU organic regulations. Nonetheless, experiences in Brazil, India, the Philippines and many other countries, and the overall increasing success of PGS, present significant opportunities for spreading sustainable production and consumption patterns. Worldwide, thousands of farmers now sell their goods through PGS. These are mostly small-scale farmers and farming families engaged in short-chain or direct market channels, which by their very nature address several critical global issues simultaneously. Shorter chains mean more value gained by each link in the chain – and thus better income for farmers and better value for consumers. 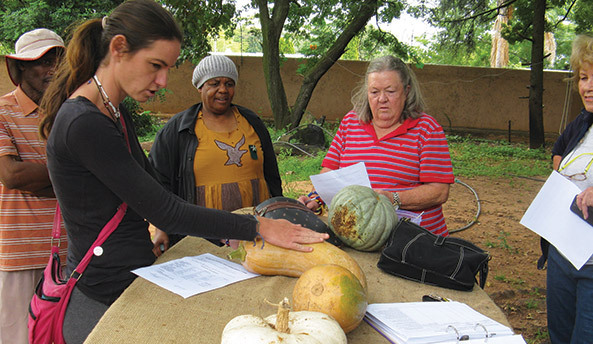 PGS foster personal relationships among farmers and consumers, which are reflected in their mutual investment in positive outcomes toward their well-being and the care of their natural resource base. The result is greater empowerment of community-based food systems, where responsibility is shared across value chains. Food chains get transformed from impersonal supply chains (i.e., every link for itself) into value chains (interdependence among links, shared responsibility and benefits) and food systems that enhance local and regional agricultural development, enrich culture and raise public awareness, all in a positive feedback loop. PGS represent a paradigm-shifting approach in action. The particular arrangements of any given PGS may vary according to locality, demographics and other contextual factors, but they share common, globally-recognizable key elements and features (see infographic). IFOAM-Organics International maintains a common platform for learning and promotion in order to keep their distinguishing features consistent, credible and accessible. To learn more, please visit: www.ifoam.bio/pgs. The entry of fair trade into the certification business was both a milestone and a bane for the movement. It is a good thing that some products produced according to fair trade standards are differentiated in a label-conscious market, and thus products with certified fair trade labels enjoy recognition and are able to access more markets. But as products labelled fair trade, like coffee, cacao, tea, cotton and other commodities, became popular and slowly entered mainstream markets, other fairly produced and traded products were left behind. It was a different scenario, especially for many non-food fair trade products that did not and could not carry a fair trade label. The majority of World Fair Trade Organization (WFTO) members experienced a kind of discrimination, even within the fair trade market. While fair trade was in their core mission and at the heart of all their practices, their products were not recognised as such because of the absence of a label. Then why not make a label for their products? This may sound like a question with an easy answer, but in reality not all products that are fairly produced and traded can be certified under the current fair trade certification schemes due to the impracticality and cost implications of the process. This particularly holds true for many products from small-scale artisans and farmers. Thus, at the 2011 Annual General Meeting (AGM) in Mombasa, WFTO members decided that the organization should develop a fair trade verification system that recognizes producers whose activities are fair trade, along with an accompanying fair trade label for their products. Following that historic decision, the WFTO board commissioned a group of experts in the field of fair trade verification and monitoring. The members of the group came from various organizations, both external and from within the WFTO network, in addition to at least one representative from all regions where WFTO members were operating. The group was led by WFTO President Rudi Dalvai. After two years of intense work and subsequent system testing in both Northern and Southern member organizations, the WFTO membership approved the WFTO Guaranteed System (GS) at the 2013 AGM in Rio de Janeiro after it was presented in the meeting along with results and feedback from pilot organizations. This brief history of the development of the GS needs to be mentioned, as it illustrates the primary reason why WFTO came up with a new fair trade system in the first place. It also provides some background on the unique features of the system, which were largely influenced by the wishes of the members, a good number of whom have a long track record in the fair trading business. The GS is not only a fair trade verification and monitoring system, it is also a tool to improve fair trade practices of organizations in the supply chain. It builds on WFTO’s time-tested and improved monitoring and membership system. There are five main components of the GS: the new membership application process, the self-assessment, the peer visit, the monitoring audit and the Fair Trade Accountability Watch. Each component has its own dynamic procedure and allows fair trade assessment from a different perspective. Combined, they make up a holistic approach that has revolutionized modern fair trade without watering down credibility and integrity. Periodic verification. After joining WFTO, trading members follow a monitoring schedule that must be fulfilled in order to maintain membership and to be able to use the WFTO label as a Guaranteed Member. The self-assessment, peer visit and monitoring audit are the different verification procedures to be followed under the schedule. The frequency and timing of the procedures vary depending on the member’s risk category. Participatory assessment and monitoring. The GS is a democratic monitoring process that provides space for the member and its peers to participate in the compliance verification process. 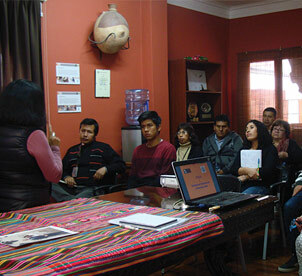 This allows members to learn from each other and exchange best fair trade practices. Continuous improvement. Each verification procedure allows members to see both their strong and weak points. The GS requires the member to prepare an improvement plan addressing weak areas, and progress is reported and assessed in the next monitoring cycle. Fair Trade Accountability Watch. This is a special monitoring mechanism that allows anyone to report best practices or non-compliance issues relating to WFTO members. As an online reporting system that is freely accessible on the WFTO Web site, it allows the public to participate in monitoring the fair trade compliance of members. See it at: www.wfto.com/standard-and-guarantee-system/fair-trade-accountability-watch. The unique characteristics of the GS make it an extremely useful development and business tool for members. It is a development tool because it enables members to adhere to the principles of fair trade, helps them to realize the goals of fair trade (trade that delivers sustainable livelihoods and a more just economy), and helps them, especially those who are small-scale producers, to escape marginalization. The GS is also a business tool because it enables each organization to strive for best fair trade practices. The periodic assessment and continuous improvement allow WFTO members to excel in fair trading, thereby making them more distinct from conventional trading organizations. At first, it was the desire to have a distinctive fair trade label for organizations that motivated WFTO members to come up with the GS. But for a label to be credible, especially when it is used on a product, a good system should back the claims of that label. The GS is about more than simply paving a way for a fair trade label. It was developed to be used by any type of fair trading organization, as long as their core mission and the heart of their activities is fair trade, in order to guide them toward best fair trade practices and excellence. The GS was designed by experts with small-scale producers especially in mind – those who may not be able to hurdle a complicated system. As a result, it is a clear, affordable and revolutionary system. To learn more, please visit: www.wfto.com/standard-and-guarantee-system. Small is Beautiful: But Can Its Rules be Applied to the Fashion Industry?